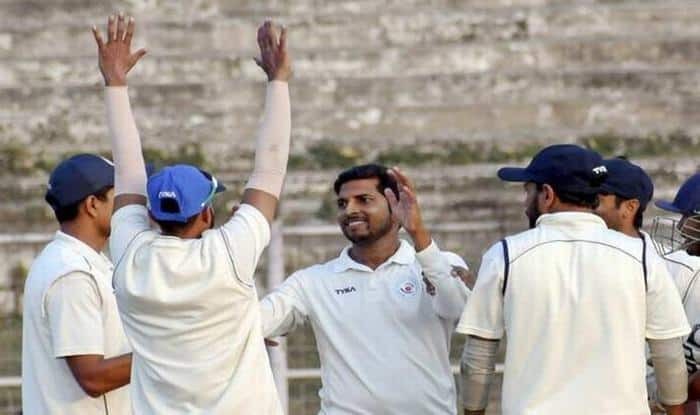 Wickets taken by Bihar's Ashutosh Aman in this Ranji season is the most ever in a single season, beating Bishen Singh Bedi's 44-year-old record. Bihar left-arm spinner Ashutosh Aman etched his name in record books, surpassing the great Bishan Singh Bedi as the highest wicket-taker in a Ranji Trophy season after claiming his 65th scalp on Wednesday. Bihar defeated Manipur by three wickets, while Uttarakhand sealed the lone quarterfinal spot from the Plate Group with a bonus point win over Mizoram in the Plate Group. The 32-year-old Aman achieved the feat when he trapped Manipur’s Sagatpam Singh lbw for his 65th wicket and eclipsed former India captain Bedi’s tally of 64 wickets for Delhi in 1974-75. An employee of Indian Air Force, Aman, ended up with 7/71 against Manipur in the second innings to end the season with 68 wickets from 14 innings at an average of 6.48. Resuming the day at 217/7 in their second innings and with a lead of 116, Manipur were bundled out for 238, with Aman claiming all the three wickets at the Moin-ul-Haq Stadium. Chasing 138, Bihar were tottering at 43/5 before Mangal Mehrur (53) led a solid fightback while Aman remained unbeaten on 22 to seal a tense three-wicket chase. Needing just a win to edge out Bihar, Uttarakhand secured massive innings and 56 run-win over Mizoram at the Rajiv Gandhi International Cricket Stadium in Dehradun. Uttarakhand topped the table with 44 points with Bihar finishing second with 40 points. Resuming the day for 32/1 following on, Mizoram could only manage 123 runs in reply to Uttarakhand’s 377 with Rajat Bhatia claiming 4/17. Taruwar Kohli waged the lone battle for Mizoram with a valiant 68 in the second essay to go with his 96 in the first innings and was adjudged man-of-the-match. For Uttarakhand, Mayank Mishra took 3/29 while Sunny Rana claimed 2/14. Uttarakhand will be taking on the combined table-topper from Group A and B. In Dehradun: Uttarakhand 377. Mizoram 198 and following-on123; 59 overs (Taruwar Kohli 68; Rajat Bhatia 4/17, Mayank Mishra 3/29). Uttarakhand won by an innings and 56 runs. Points: Uttarakhand 7, Mizoram 0. In Dimapur: Nagaland 467 and 185/5; 55 overs (HH Zhimomi 49 batting, Arbar Kazi 42 batting). Puducherry 286; 98.2 overs (Paras Dogra 144, Sai Karthik 81; Arbar Kazi 4/62, Imliwati Lemtur 3/57). In Goalpara: Arunachal Pradesh 169 and 109; 45.3 overs (Kshitiz Sharma 31, Techi Neri 23 not out; Ishwar Chaudhary 7/51). Sikkim 262 and 19 for no loss; 1.3 overs. Sikkim won by 10 wickets. Points: Sikkim 7, Arunchal Pradesh 0. In Patna: Manipur 156 and 238; 70.4 overs (Yashpal Singh 105, Priyojit Singh 64; Ashutosh Aman 7/71, Samar Quadri 3/93). Bihar 257 and 140/7; 25.1 overs (Mangal Mehrur 53, Vikash Ranjan 39, Ashutosh Aman 22 not out). Bihar won by three wickets. Points: Bihar 6. Manipur 0.